A few weeks ago, I gave a keynote address at the Southern California Conversion Technology conference in Los Angeles, held by the Los Angeles County Department of Public Works. The conference covered a wide range of technical and policy issues related to the deployment of advanced technologies to convert municipal solid waste into energy. 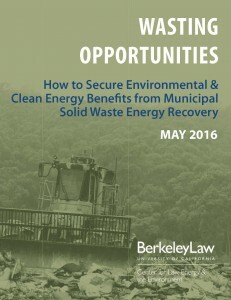 It’s a subject we covered at Berkeley Law in a recent report entitled Wasting Opportunities: How to Secure Environmental & Clean Energy Benefits from Municipal Solid Waste Energy Recovery. The conference material, including presentations and video of the various sessions, is now posted on-line. You can access them here, and my keynote video is below and also posted on my video page. We had an interesting discussion in particular about the need to engage environmental justice communities in the process, as well as other pressing policy matters that affect the industry.